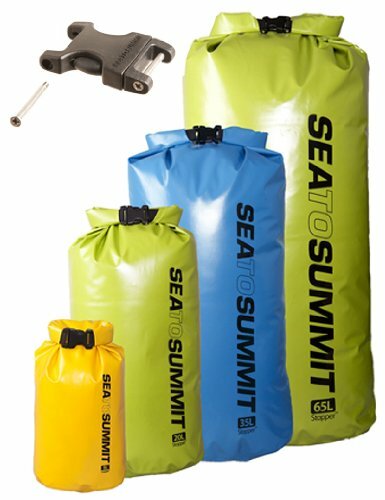 These fully welded dry bags are made with 210D nylon fabric with TPU lamination on the outer face for durability, water shedding, and abrasion resistance. The clean profile and oval base resists rolling and allows for easy packing. The high strength fabric is UV resistant and won't crack in extreme cold. SIZE/WEIGHT: 5 Liter - (7in x 4in base) x 15in high, 4 oz/115g; 8 Liter - (5in x 8in) x 17in, 3.6oz/101g; 13 Liter - (9in x 6in) x 20in, 4.4oz/125g; 20 Liter - (11in x 7in) x 24in, 6.3oz/180g; 35 Liter - (13in x 8in) x 28 in, 8.5 oz/240g; 65 Liter - 15in x 10in) x 33in, 11.5oz/327g. If you have any questions about this product by Sea to Summit, contact us by completing and submitting the form below. If you are looking for a specif part number, please include it with your message.